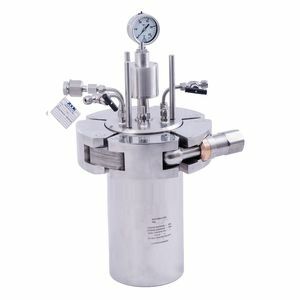 RVD series high-pressure reactors are used for reactions of hydrogenation, polymerization, chemical synthesis, catalytic reactions, synthesis of zeolites or nanoparticles, study of biological fuel, biomass, and for carrying out tests of various materials under pressures up to 200 bar. 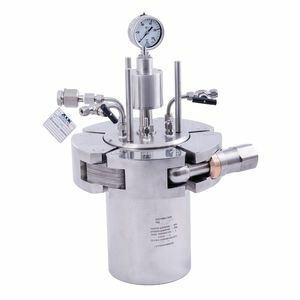 These reactors have a wide range of operating pressures and temperatures (up to 200 bar and 250°C), which covers the majority of chemical reactions in laboratory conditions. They are equipped with a fast locking and sealing system that considerably accelerates loading, unloading and cleaning of the device. 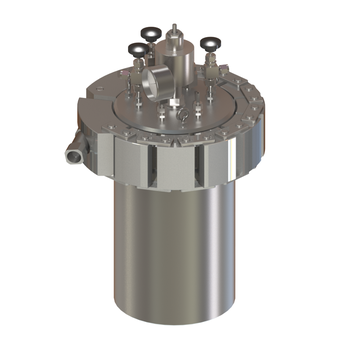 All reactors of the RVD series are made of AISI 316L stainless steel. Protective PTFE inserts are available for work in aggressive media. The reactor can also be supplied with a glass insert for convenient removal of product from the reactor. RVD-3-700, RVD-3-1000, RVD-3-2000, RVD-3-5000 – large-scale laboratory reactors.